Memories can be long when it comes to failures of the past, and old bitterness sometimes dies hard. 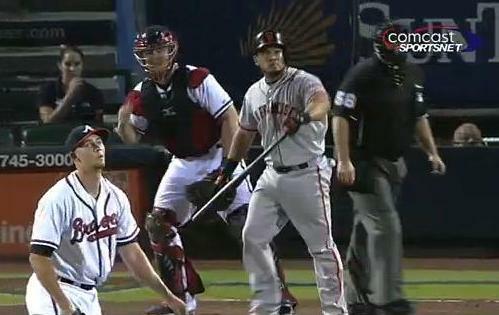 There’s little question after Wednesday night’s Giants-Braves game that Melky Cabrera harbors some old bitterness. He never found his groove during his lone season in Atlanta, in 2010, receiving scant affection from fans, media and the organization itself. Of course, much of it was deserved—he showed up out of shape, hit only four home runs, finished eighth among team regulars with a .255 batting average, and dead last in OBP, slugging and OPS. He feuded with manager Bobby Cox, and the team released him after the season. When Cabrera returned to Atlanta for the first time since then this week, he wasted few opportunities to make his feelings known. On Tuesday, he gestured (some say rudely) toward fans in the left field bleachers after catching a fly ball, and acted as if he would toss balls to the stands before reversing course and holding on to them. He spent some time admiring his home run off of Mike Minor on Wednesday. (Tater Trot Tracker listed it as the day’s fifth slowest circuit, out of 39.) With Jason Heyward at second on Wednesday, Cabrera caught a flyball and waved at him with his glove as if urging him to test the outfielder’s arm. When Brandon Crawford hit what turned out to be the game-winning homer in the 11th inning on Wednesday, Cabrera left the dugout and skipped up the warning track. Things had built to such a degree that after he and Gregor Blanco scored on Blanco’s 11th-inning home run Wednesday (shortly following Crawford’s), their standard pelvis-thrusting celebration was taken by many to be inflammatory. The Braves noticed all of it. In the eighth inning Wednesday, reliever Eric O’Flaherty threw a high, inside fastball to Carbrera, knocking him to the ground. The gesture elicited a smile from the outfielder. Speculation had Tim Hudson, starting Thursday for the Braves, offering further retaliation, but the score was close throughout, and Cabrera ended up going 2-for-3 with a walk without being hit. For his part, Cabrera claimed to CSN Bay Area (through interpreter Angel Pagan) that it was all in good fun. Difficult as that may be to believe, Giants manager Bruce Bochy defended his player—although some of it was clearly lip service. Atlanta visits the Giants in late August. Mark your calendars.